There are few places in New York City that can claim such a wonderful, deep history of music making. When the Cathedral was built, it was located amid woodlands and fields. In 1815, the city had the cultural sophistication of a small colonial outpost, lagging far behind other cities in America, and it struggled for an artistic position that matched its burgeoning commercial might. It wasn’t until 1842 that an orchestra was formed in New York City (the Philharmonic, after three other attempts); it was another generation when, in 1896, the first music professorship was created (Edward MacDowell at Columbia). In this milieu, the Cathedral was one of the few places to hear music of quality. Indeed, in an era when music was not accessible anytime, anywhere, as it is today, even culture-starved Protestants began to visit the Cathedral. In 1826, the first in a long line of benefit concerts was given for the Orphan Asylum, and later, St. Patrick’s Old Cathedral School . The Italian Opera Company, the first opera company to perform in New York, was led by Manuel Garcia. It also was the vehicle of stardom for his daughter, later known as Madame Malibran, with whom all subsequent prime donne were compared. The Garcias were brought to New York by Dominick Lynch, a Trustee of the Cathedral and sophisticated son of a banker who, recently returned from his Grand Tour, desired to finally “bring some culture” to New York. 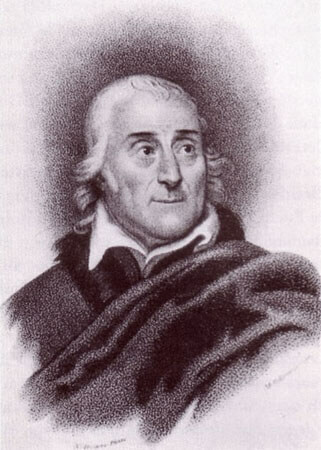 When the Garcias arrived, Lorenzo da Ponte (1749–1838), Mozart’s librettist, was there to greet them; his brilliant collaborations with Mozart on Le nozze di Figaro, Don Giovanni, and Cosí fan tutte 40 years previous were presented to an entirely new audience! Lorenzo, too, passionately tried to increase the level of musical sophistication in the city until his death in 1838. Da Ponte’s Requiem Mass took place at St. Patrick’s (Old) Cathedral, to the sounds of Allegri’s Miserere (this piece had been kept out of reach, a treasure of the Sistine Chapel, until the 14-year-old Mozart heard it and transcribed a “bootleg” from memory). There is surely more musical history to be discovered relative to the order of worship, musical selections, and performance practice of these earlier times. We continue to search for historical materials for our archives; much has been lost. Unfortunately, the last century is an abyss; no names, programs, or hymnbooks outside of those from the last 20 years. Surprisingly, the 19th-century history is better documented; at that time, newspapers gave detailed accounts of Easter, Christmas, ordinations, and other celebrations. Though there was much original music performed in the past, notably by Gustavus Schmidt (sic), there are sadly no extant copies in the church’s possession. Transcriptions by Cathedral Organist John White have been found, as well as sacred choral music by William Bristow’s son. Organs of the mid-19th century were icons of the technological and cultural progress of the newly industrial American society. The Erben played a very important role in the rapidly expanding Catholic Church in New York and in the cultural life of the city. It is difficult to imagine a world in which music is not accessible in full fidelity, everywhere, as it is today. Before the invention of recorded sound and the foundation of philharmonic societies, the organ was the only mechanism able to interpret the new European orchestral music and American popular music of the time for large audiences. Looking across the Atlantic for musical leadership, America’s leading musicians were either natives of Europe or spent time studying there. This fact is evident from the beginning at the Cathedral, whose first music, and musical leadership, came from all over the world. The program from the inaugural recital of the 1852 instrument shows a German and English influence in repertoire and performer, but there are also improvisations (one on a French opera by an American). The 1869 program from the exhibition of the current organ features a great deal more opera transcriptions. Though there was music at the opening of the Cathedral in 1815, it is difficult to surmise what it was or who performed it. Only second- or third-person sources exist to cobble together even this very incomplete list. 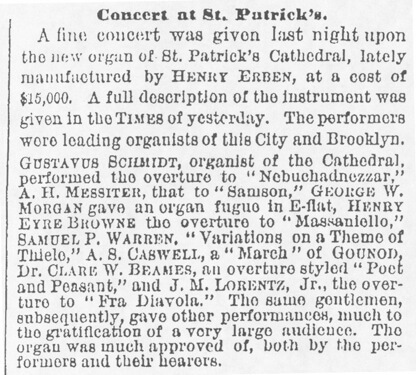 Generally, there was a professional quartet at the Cathedral, augmented by the volunteer St. Patrick’s Choral Union. 1800: Henry Erben is born, March 11, in New York. 1809: The cornerstone of St. Patrick’s Cathedral is laid on the grounds of the existing cemetery, amidst fields and woods. 1815: Organ built by William Redstone (c. 1768–1824). One manual. 1816: Henry moves to Philadelphia to become Thomas Hall’s apprentice. 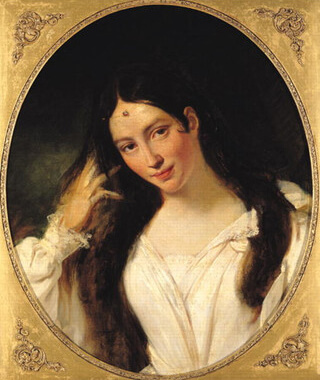 1818: Hall marries Henry’s older sister, Maria, at Trinity Church. Hall’s Philadelphia shop destroyed by fire; he relocates to New York. 1820: Thomas Hall (1791–c. 1875) enlarged and altered the Redstone organ. Information on Rabbeson’s activities was found in only one source, from 1899. The article describes a benefit concert by the first Italian opera company in the United States. The leader of the orchestra at the event was Mr. De Luce, with Messrs. Etienne and Moran, leading a varied program of Haydn, Handel, Cimarosa, Zingarelli, and Dr. Arne (likely Dr. Thomas Arne,1710–1778). In this account, Rabbeson is not mentioned in the program. Rabbeson’s name is listed in an early music directory of New York City as a turner as well as a music teacher. His last address seems to have been 30 Prince St. as of 1834. It is interesting to note that the new musicians coming to New York from Europe after the War of 1812 most certainly had an effect on the music scene in New York and contributed to the appreciation of good music generally. Denis-Germain Etienne (1781–1859) was a prize-winning graduate of the Paris Conservatoire who arrived from France in 1815. He was a pianist/composer/teacher and played the French horn. Etienne was one of three conductors at the first performance of the New York Philharmonic in 1842. 1825: The Erie Canal opens between Albany and Buffalo. 1826: Hall & Erben organ installed, three manuals. Erben apprenticed with Thomas Hall, beginning in 1817, when Hall moved to New York. Hall was also married to Henry’s sister, Maria. 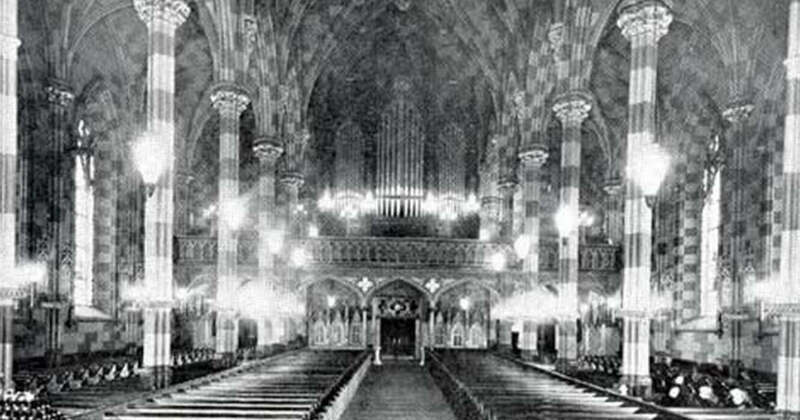 Hall eventually went on in the 1840s and formed Hall & Labagh, which firm built the Basilica's 1859 Chancel Organ. 1835: Erben’s factory on the corner of Center and Canal street is destroyed in a fire, causing a riot. 1836: Henry is elected to the New York Common Council as Assistant Alderman, representing the 6th Ward. 1837: Samuel Morse develops and patents the recording electric telegraph. 1841: Erben’s factory again destroyed by fire; damage reported at $40,000. 1843: Erben’s barn is set on fire. Thomas Hall resigns and establishes his own business (Hall & Labagh after 1845). Also the Organist of the New York Sacred Music Society,  he took over from Bristow. His name is ubiquitous in concerts with the founder of the Philharmonic, U. C. Hill(1802–1895), and at any new Erben organ exhibition. 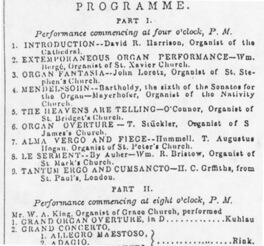 Harrison is still listed on the program as “Organist of the Cathedral” at the grand exhibition of the new 1852 Erben organ, which was destroyed by the 1866 fire. In 1861, he is listed as “Organist and Conductor”, with a quartet choir: Mrs. Sweeney, Soprano; Miss E. Pearson, Contralto; Antony Rieff, Tenore; and C. Blochinger, Basso. 1846: Trinity Church organ dedicated, with exhibition Oct. 7 and 8 attracting 18,000 people and American Institute awards Erben a gold medal for the instrument. 1849: Fire again destroys his factory; Henry’s wife, Mary Luff Erben, dies, a victim of a cholera epidemic. 1852: Henry Erben organ, three manuals, destroyed in 1866 fire. Meehan, Thomas F., Historical Records and Studies, “The First Charity Concert for the Catholic Orphans in New York”, United States Catholic Historical Society, 1899, p. 368. Lawrence, Vera Brodsky, Strong on Music, Vol. I, Resonances 1836–1850 (New York, Oxford University Press,1988). See p. xl. Ibid., p. 74, 109, 113, 486 et. al. “A New Phase in Musical Matters,” The Musical World and Journal of the Fine Arts, Vol. 3, No. 21 (1 July 1852): 359–360. Courtesy of Stephen Pinel. Lawrence, Vera Brodsky, Strong on Music, Vol. I, Resonances 1836–1850 (New York, Oxford University Press, 1988), p. 112. Lawrence, Vera Brodsky, Strong on Music, Vol. III, Repercussions 1857–1862 (Chicago, The University of Chicago Press, 1999), pp. 298, 440. Lawrence, Vera Brodsky, Strong on Music, Vol. III, Repercussions 1857–1862 (Chicago, The University of Chicago Press, 1999), p. 537. Lawrence, Vera Brodsky, Strong on Music, Vol. II, Reverberations 1850–1856 (Chicago, The University of Chicago Press, 1995), p. 423. Courtesy of S. Basile, who has written a history of music in the Archdiocese. Courtesy of Stephen Pinel, Archivist, American Organ Archives of the Organ Historical Society, Princeton, NJ.